Monday morning I needed a stapler. So on my way in to the workshop, I stopped at a local office supply store to grab one. The place was called "Staples," so I figure there's a good chance they'll carry staplers. Easy, right? The problem is, on the rare occasion when I decide I need a stapler, for some reason I tell myself I'm going to get myself a red Swingline stapler. * I'm not sure why, but that's exactly what I want. So I walk into the store and, despite finding dozens of viable stapling options, none of them are red Swingline staplers. Desperate to bind some pages together, I had to settle for a plain, black stapler like some kind of peasant. Clearly the world is not on my side. Fortunately, I live in the 21st century. In my world, everything that can be had can be delivered with free two-day shipping. So I go to Amazon and wouldn't you know it, there's actually multiple options when it comes to red Swingline staplers. I picked this one: LINK. That's the classic Swingline model 747. Sadly, it doesn't also happen to be an airplane, but its all-metal construction means I can use it bludgeon things when I'm not stapling things. Awesome. Of course, since I was already shopping online, I also had to pick up some ABS filament for the 3D printers and an anatomically correct replica of a human skull because I'm an adult and you can't tell me what to do. Then I found a 10-pound box of hot glue sticks which I need for reasons. I decided not to buy the 17-pound box, because that would just be silly. *Little-known fact: The folks at Swingline had discontinued their red stapler a few years before the movie Office Space came out. 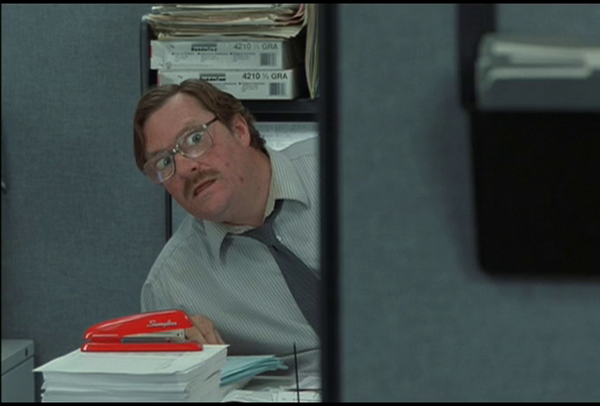 Milton's iconic red Swingline was actually a regular stapler that had been repainted by the film's prop department. After the movie came out, Swingline was inundated with folks asking for red staplers, so they decided to start offering the color again. It's been their best seller ever since.